Majority of the members of the Mahinda faction of the UPFA have decided to remain in the process to compile a new constitution despite a few members of Wimal Weerawansa’s party decided to keep away from the process says Parliamentarian Vasudeva Nanayakkara. Mr. Nanayakkara said the decision to remain in the constitutional process was taken at a discussion held at the official residence of the retired president Mahinda Rajapaksa. When functioning in the Constitutional Assembly the political parties are regarded as the UPFA, the UNP, TNA, the JVP, SLMC and the EPDP. As such Mahinda faction or Wimal Weerawansa’s party doesn’t get a separate representation in the assembly. They are considered as members of the UPFA. The proposed Inland Revenue Act has been compiled by the IMF and presented to parliament for approval says the Leader of the JVP Anura Dissanayaka. He said this at a press conference held at the head office of the JVP at Pelawatta yesterday (20th). Members of the Central Committee of the JVP Northern Provincial Councilor Wasantha Samarasinghe and Western Provincial Councilor Sunil Watawala too were present. Mr. Dissanayaka addressing the media said, “The new proposed Inland Revenue Act has been compiled by the IMF and presented to parliament for approval. Earlier, the Governor of the Central Bank stated the act has to be approved to get a second instalment of the line of credit by the IMF. An announcement issued by the Central Bank on the 8th states, “Following the Executive Board’s discussions of the review, the IMF has commended the stable macroeconomic and financial condition of Sri Lanka despite severe weather events and global market volatility. The IMF has also welcomed the fiscal consolidation measures implemented by the Government, particularly the submission of the new Inland Revenue Act to the Parliament.” This indicates the act has been compiled by the IMF. Officials of the Department of Inland Revenue, trade unions, tax paying citizens or audit institutions in our country have not mediated in compiling this act. The pact is the same pact compiled by the IMF to Ghana with a few changes. It is not one that has been compiled taking the interests of officials of the Department of Inland Revenue, tax payers and those interested in taxes. The act presents legal amendments that tally with the plundering economic policy followed by the IMF throughout the world. The act has been introduced as one that the government promised to introduce to the Department of Inland Revenue as well as to other financial sectors. The clauses in the act go beyond tax amendments introduced in the budget. The act introduces a large number of tax amendments that have adverse effects on the country and the people. The 10% tax that is levied when investing from the EPF has been increased to 14%. As a result funds of more than 2.5 million members of IMF would be slashed. Also, tax reliefs that had been given for the development of various sectors have been completely removed. Despite, the tax levied on the income from stage plays had been given a tax relief of 50%, the new act has removed the relief. Also, writers and publishing institutions had been given a 50% tax relief for the income from their first publications, the proposed act has removed it. The musicians had their income from the creations exempted from any tax. However, the proposed act removes this concession. The new proposals remove the tax relief given to new inventions. The aid to university students, presents awarded by the President, the benefits the insured senior citizens get once the insurance is matured had been exempted from tax. However, all of them are taxed by the proposed Act. Accordingly, everything in the cultural, inventive and educational sectors has been brought under tax schemes. The10% tax levied for agricultural implements has been raised to 14%. The 12% tax levied for small and medium scale industries has been raised to 14% and the 10% tax levied from lottery wins has been raised to 14%. The tax amendment act has presented more tax amendments that what is included in budget proposals. The Pay As You Earn (PAYE) Tax from those who are employed has been raised. In the earlier budget professionals who earn 1.2 million per annum had been given a tax relief. The amendment was not presented to parliament or approved. However, the proposed act has brought down the annual nontaxable income to Rs.500,000. As such, all professionals who earn more than Rs.500,000 would be taxed. Also, the tax rates for the taxable income were 4%, 8%, 12%, 16% etc. However, the new act increases the 16% ratio to 24%. Also, professional institutions such as the Institution of Engineers Sri Lanka, Sri Lanka Banks’ Association, Universities, Medical Council, Sri Lanka Institute of Printing, the Energy Conservation Fund have been brought under the tax scheme. Also, the income earned by Sri Lankans supplying services to foreign institutions or income obtained supplying services abroad were exempted from tax. For, the foreign exchange earned and the experiences and know how the professionals get is very important for our economy. However, all these sectors have been made taxable. However, income received by a foreigner serving in Sri Lanka has been exempted. The government, instead of encouraging Sri Lankans supplying services to foreign institutions, encourages foreigners to take the place of Sri Lankan professionals. This move has been proposed to encourage foreigners who would come to Sri Lanka through EYCA agreement the government is waiting to sign with India. As such, we have a doubt whether the government in Sri Lanka is that of Sri Lankans or westerners. The Department of Inland Revenue has to explain the reasons when it rejects any reports of income submitted by tax payers. It would confirm the rights of the tax payers. However, the new Act has given the authority to reject reports by tax payers without submitting any reasons. This is very unjustifiable. The Taxpayers’ Association of Sri Lanka has filed a case against this. Also, the Department of Inland Revenue consists of a commissioner general and officials below him. However, according to clauses in 2006 Act, other officials too have been given certain authority. This would make administration efficient. However, the new Act nullifies the authority of other officials and the whole authority is centred on the commissioner general. The commissioner general has been given unlimited authority and all other officials have been made submissive to him. It is a hindrance to the efficiency of collection of taxes. The commissioner is also given powers to appoint outsiders for the process. This would also allow the commissioner to appoint a private company for the process of collecting taxes. This is a move to give the authority the government had to collect taxes to private companies. This is the need of the IMF. The functions of the Department of Inland Revenue could be handed over to private companies through this Act. Also, any official committing a tax fraud could be investigated only by the Commission to Investigate Allegations of Bribery or Corruption. However, the proposed Act contains a clause that states any official committing such a fraud could be fined Rs.1 million or one-year prison sentence or both. Also, the Commissioner has been given powers to settle the matter without going to a trial. This has made all officials under the commissioner submissive to him. As such, the proposed Act obstructs administration and hinders efficiency. It is difficult to understand the Act as certain words that do not occur in our glossary of terms have been included in it as it is a translation of the English version of the Act prepared to Ghana. It is very clear that the Act has not been compiled targeting Sri Lanka. The records received by the Department of Inland Revenue are very confidential. They would be available only to the Bribery Commission, Attorney General or the Minister under special provisions. The tax payers are given this protection to prevent their confidential information from being made available to wrong persons. Information of income of any establishment is confidential. However, the Act presented by the government states exchange of tax information or come to an agreement with foreign companies is possible with the recommendation of the Minister. This deprives the protection for the tax payer. It is a threat to businessmen. At present, the Department of Inland Revenue carries out its tax collecting process using a special software. This software was created by a company in Singapore. The Department of Inland Revenue has spent Rs. 5000 million for this. This process carried out tax collecting very efficiently. In creating this software the legal regulations of the Act in 2006 were followed. However, due to the bringing in of a new Act in place of the earlier one, it would not be possible to use the software created spending Rs.5000 million. A new software would have to be created. Of course, IMF has agreed to make available a loan for this. When considering all these facts it is very clear that the new Act is a need of the IMF. As such, this Act should not be passed in Parliament. The 2006 Act should be made more efficient by adding amendments. However, there is no need to bring in a completely new Act. The only necessity of bringing in a new act is to prepare legal background to manipulate the economy of our country according to the needs of the IMF. This is why IMF releases the loan instalment when the Act is presented to Parliament. When the government wanted to present the Act in Parliament we asked the government to have a discussion with relevant sectors. However, Prime Minister Ranil Wickremesinghe was adamant that the act should be put to Parliament. President Maithripala Sirisena has signed the Office of Missing Persons (OMP) Act yesterday (20th). The President will make the appointments once the Constitutional Council names 7 members including a chairman. The Office of Missing Persons (OMP) Act was unanimously passed in Parliament on 11th August and on 23rd August Speaker Karu Jayasuriya put his signature for the Act. The Act was passed with several amendments added by the JVP and several other parties. The Police Commission gave permission yesterday (20th) to interdict former senior DIG in charge of Northern Province Lalith Jayasinghe, arrested and remanded on charges of allowing Swiss Kumar, the main suspect in the murder of the school girl Vidya of Punkuduthivu, to flee to Colombo, The student Vidya was gang raped and brutally murdered on 13th May, 2015. The permission to interdict Jayasinghe was given when the IGP wrote to the Commission asking for permission to interdict former DIG says the Secretary to the Commission Ariyadasa Cooray. Members of ‘Anti-SAITM People’s Wall’ were able to foil an attempt to abduct the convener of Medical Faculty Students’ Action Committee Ryan Jayalath by a group that had come in a white van. Mr. Jayalath had come out of the office of the GMOA where a discussion had been held to discuss organization of the National Convention of the ‘Anti-SAITM People’s Wall’ to be held at the Open Air Theatre at Viharamahadevi Park on the 25th. It is reported that political leaders, trade union leaders, Members of the Parents of Medical Faculty Students and student representatives had to make a great effort to prevent Mr. Jayalth from being abducted. The President of National Trade Union Center (NTUC) K.D. Lal Kantha, the General Secretary of Lanka Teacher Services Union Mahinda Jayasinghe, Dr. Navin Soyza of the GMOA and Medical Faculty activists exchanged words with police officers who arrived at the scene. 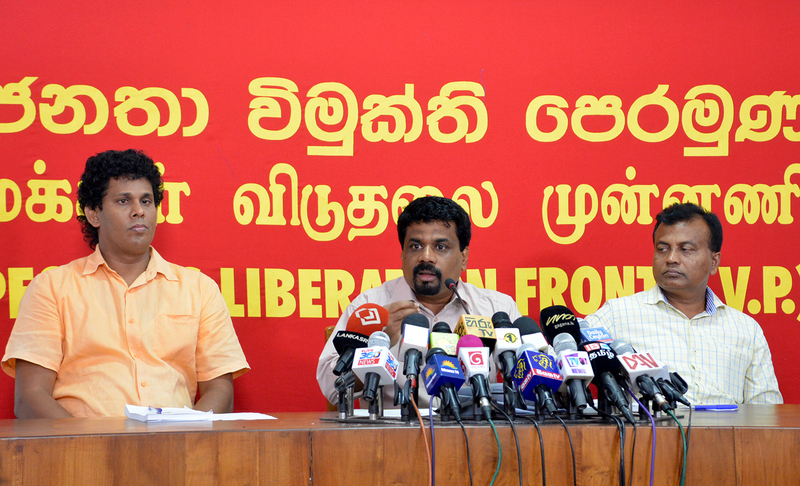 Mr. Lal Kantha speaking to the media said the present government that promised good governance, democracy and Lichchhavi type of administration has resorted to the ‘white van’ culture following the Rajapaksa regime. He said if the government continues along this path it would be the end of the government. 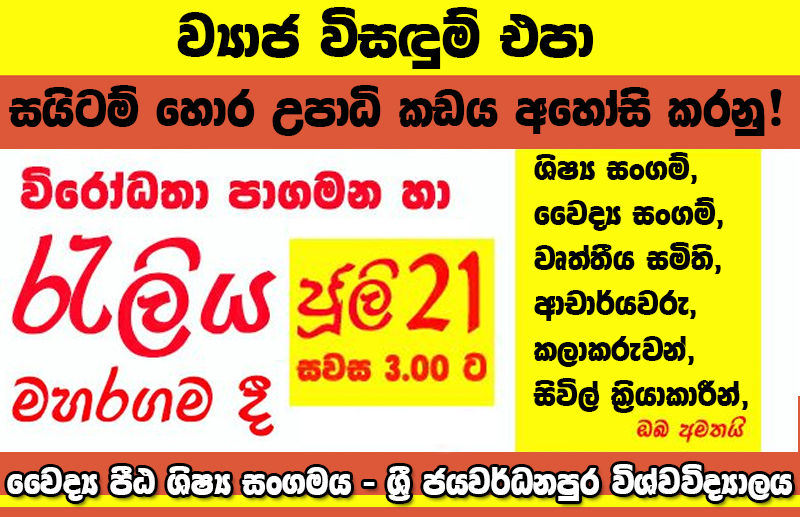 The protest march and rally organized by the Medical Faculty Students’ Union of Sri Jayawardenepura University demanding the government to immediately abolish SAITM medical degree selling institute at Malabe will be held at Maharagama tomorrow (21st) at 3.00 p.m. The rally held under the theme ‘No pseudo solutions – Abolish illegal SAITM boutique’ will be addressed by representatives of students’ unions, unions in the health sector, members of university academic staff, artists and civil activists. A leaflet distribution campaign to demand the government to abolish SAITM, the medical degree selling institute at Malabe and to make the masses aware of the move by the government to sell state enterprises, its scheme to slash the pension rights and bring in ETCA agreement will be launched by ‘Anti-SAITM People’s Wall’ throughout the island tomorrow (21st). Also, the National Convention of the ‘Anti-SAITM People’s Wall’ will be held at the Open Air Theatre at Viharamahadevi Park on the 25th. The Organizers invite masses to participate and show their solidarity with anti – SAITM struggle. Former Deputy Minister of Sarana Gunawardene has been fined Rs.2000 by Colombo Chief Magistrate Lal Ranasinghe Bandara for not declaring assets and liabilities during the two-year tenure as the Chairman of National Lotteries Board during Mahinda Rajapaksa regime. Sarana Gunawardene pleaded guilty last week to two corruption cases filed against him by the Commission to Investigate Allegations of Bribery or Corruption and the fine was ordered today (20th). He was also released on bail as he pleaded guilty to the offences. When the case was called today the Magistrate ordered the suspect to pay the relevant fine and ordered a 6 month’s sentence if the suspect fails to pay the fine. During Sarana Gunawardene’s tenure as the Chairman of the National Lotteries Board from 6th December, 2005 to 30th June, 2006 and also between 31st March to 31st July, 2007 he had not declared assets and liabilities and the Commission to Investigate Allegations of Bribery or Corruption filed two cases against him. Cases have been filed in Colombo Chief Magistrates Court against Sarana Gunawrdene regarding a fraud of Rs. 36,000,000 committed while he was the Chairman of National Lotteries Board and 107 other charges. Also, there are 9 other cases against him regarding hiring vehicles for the government and taking ransom. A large stock of Cocaine weighing around 160 kilos hidden inside a container of sugar imported by the CWE through a private company was seized by the Police Narcotic Bureau officials from the Ratmalana Economic Centre yesterday (19th) afternoon say police sources. The container of sugar imported from Brazil on a contract given to a private company had been brought to the Economic Center at Borupana area in Ratmalana. When the container was opened eh employees found ten bags of cocaine hidden inside the container. When police was informed the container was seized by Mt. Lavinia Police. Deputy General Manager of Pan Asia Bank (PABC) giving evidence before the Presidential Commission of Inquiry probing the alleged bond scams committed has said that the owner of Perpetual Treasuries Ltd, Arjun Aloysius, had asked him “to conceal vital information” when testifying before the Presidential Commission. He made the revelation when he was questioned by Deputy Solicitor General Milinda Gunathilake regarding the previous testimony he had given about Mr. Aloysius’ request. It was also revealed that he had visited Arjun Aloysius’ residence after the latter pleaded him to meet him. The witness said when he met Aloysius at his residence he had said that he needed his support at the proceedings of the Presidential Commission.